In a career that touched seven decades, the actor Frederick Jaeger, who has died aged 76, managed to escape typecasting by dividing his time between the stage, radio, television and film, adapting his talents to every genre. He was also an active and distinguished member of the council of the actors' union Equity for 10 years. Jaeger was born in Berlin, but, following the Nazi takeover in 1933, fled with his family, first to France and then England, to escape Hitler's persecution of the Jews. This cosmopolitan and turbulent childhood prepared him well for a career playing different nationalities and classes, and, by 1948, he had graduated from the Guildhall School of Music and Drama, and was in constant demand. His 47-year theatre career began in 1949, and included a number of West End appearances. He had great success as Ramble in Lock Up Your Daughters (1959), at the Mermaid Theatre, and reprised the role in a tour of America. He also toured Europe and Latin America, playing in Shakespeare with Ralph Richardson. Jaeger's early film credits are telling. In The Black Tent (1956), The One That Got Away (1957), I Was Monty's Double (1958) and Ice Cold In Alex (1958), he played respectively, a junior Nazi officer, a German prisoner, a junior German officer and a second German officer, despite having become a British citizen in 1950 and painstakingly removed all trace of his natural accent. Although he was to play many more Nazis in television productions in this country (Selling Hitler, 1991) and in the US (The Nightmare Years, 1989), there was more to him than that. He starred in Carla Lane's thoughtful and touching tragi-comedy I Woke Up One Morning (1985), displaying a moving fragility and vulnera bility as Derek, one of four recovering alcoholics around whom the two series revolved. An early lead had come in 1966, when Jaeger played a dual role in the espionage thriller The Man In The Mirror, and he was also Professor Bhaer in Little Women (1970), a regular in the popular series Special Branch, playing Commander Fletcher (1974), the industrialist Max Langemann in Take The High Road (1980), Chief Constable Melchett in The Body In The Library (1984) and Dr Mudal in John Schlesinger's production of Cold Comfort Farm (1995). He escaped being typecast as a heavy, partly because of his malleable appearance - burly frame, large watery eyes and permanently lined brow - and partly because he could be very, very funny; he was a hoot as a humourless head of comedy in The Fall And Rise Of Reginald Perrin (1978), and collaborated well with Barry Took on N.U.T.S and One-Upmanship (both 1976). His guest-starring roles were an immediate indication of quality in series as diverse as The Avengers (three appearances in the 1960s), Callan (1969), Doctor Who (three appearances, including playing the creator of the popular robot dog K-9), Remington Steele (Pierce Brosnan's successful US comedy thriller, 1984), Keeping Up Appearances (1990) and The Chief (1990). Jaeger's many film credits included The Looking Glass War (1969), based on a John Le Carre book and starring Anthony Hopkins, Henrik Ibsen in Song Of Norway (1970), The Seven Per Cent Solution (1976), Voyage Of The Damned (1976) and Nijinsky (1980). His first marriage, to Hazel Penwarden, was dissolved in 1972. He married Elizabeth Griffiths in 1973, and after his retirement, in 1996, moved with her to a farmhouse in Mallorca, where he died after a long illness. She survives him. APA 6th ed. : Hadoke, Toby (2004-09-08). Frederick Jaeger obituary. The Guardian p. 27. MLA 7th ed. : Hadoke, Toby. 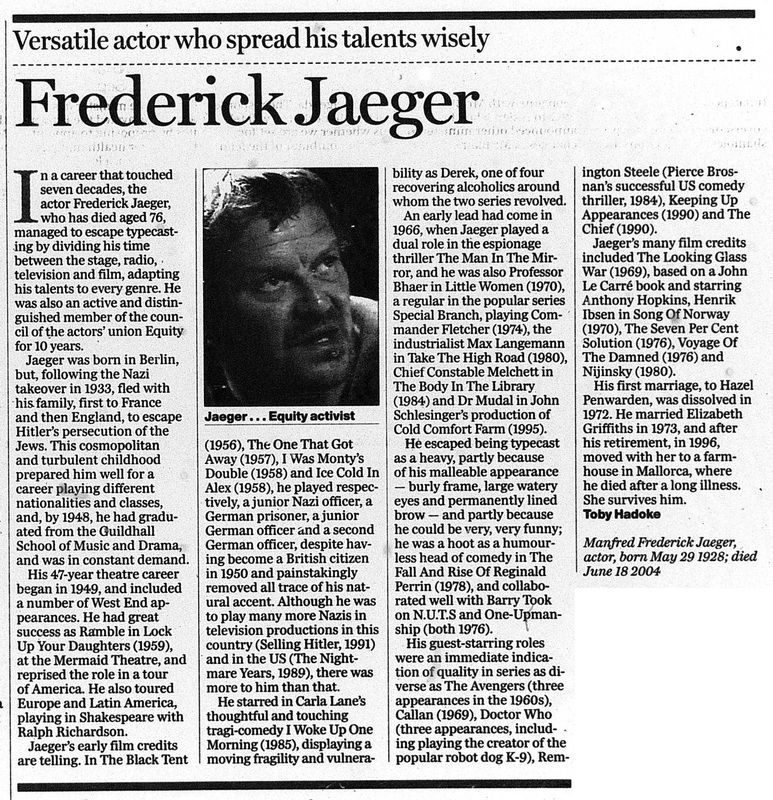 "Frederick Jaeger obituary." The Guardian [add city] 2004-09-08, 27. Print. Turabian: Hadoke, Toby. "Frederick Jaeger obituary." The Guardian, 2004-09-08, section, 27 edition. This page was last modified on 23 May 2015, at 18:33.